When starting out in jewellery making, choosing chain can seem like a daunting task. There are so many chains to choose from but it really comes down to your own personal preference and the design you have in mind. Although there are popular chains such as trace chain and belcher chain, there are also many other beautiful styles to choose from. The beauty of chain is that it can add a whole new dimension to your handmade jewellery designs. Perhaps you want a simple chain so you can put all of the focus on the pendant or maybe you want to go all out with adding extra sparkle? You can buy loose chain and use your own findings or buy ready made necklets and bracelets in a range of lengths. Shop our full range of chain for jewellery making here, including all the types featured below and more interesting styles such as twisted chain and satellite chain. Our chains are available in a range of metals including silver and gold plated, sterling silver, 14ct gold filled and 9ct gold in a range of lengths to suit you. Trace chain is one of the most popular chains for jewellery making and a great all-rounder for your designs. It has small oval shaped links, creating a fine chain that is very minimal. We offer a range of trace chains in a range of lengths and thickness in plated, sterling silver, 9ct gold and 14ct gold. Belcher chain, also known as rolo chain is very similar to trace chain however its links are wider than its thickness. This is a sturdy chain which is also popular among men's jewellery. At Kernowcraft, discover sterling silver mini and maxi belcher chains as well as 9ct gold oval belcher chain for your jewellery designs. Hayseed chain is a beautiful, light weight chain that is intricately linked together. 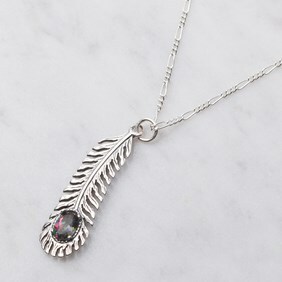 It has delicate detailing that creates a lovely sparkle when the chain catches the light. Curb chain is a heavier looking chain, the links are flattened and twisted tightly together and once laid flat, interlock together. This is a great chain for statement necklaces and also popular among men's jewellery. We offer curb chain in a range of thicknesses in sterling silver, 9ct gold filled and silver plated. Snake chain, also known as Brazilian chain is unlike any other chain as it is not made up of links. It consists of smooth metal plate links that are tightly woven to create a flexible chain. This is a smooth chain and offers a sophisticated look to your designs. We supply a beautiful range of snake chains to suit your needs, from extra fine to medium as silver plated, sterling silver to 9ct gold. Rope chain is an interesting look, featuring links that are woven together to form a twisted effect, resembling the look of rope. This is great if you're after a chain to take centre stage! 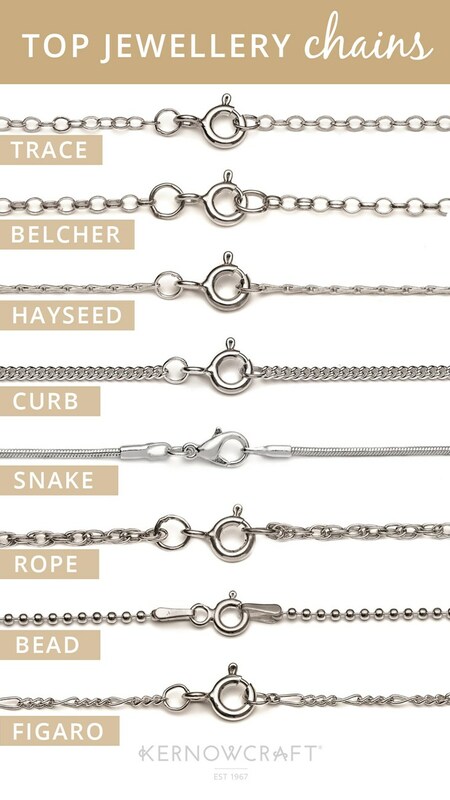 Shop our range of rope chain ranging from fine to medium in sterling silver and 9ct gold. We also offer a gorgeous sterling silver black oxidised diamond cut rope chain which is perfect for more luxurious designs. Bead chain, also known as ball chain or pelline chain, is a lovely style to choose for your designs. It features tiny metal spheres of little balls running throughout the chain, instead of open links. They are fixed at regular intervals along the length of the chain with connector bars. If you like bead chain, you may also be fond of satellite chain which is a dainty chain consisting of silver beads evenly spaced along the length of the chain. Both offer a lovely modern feel to jewellery designs. Figaro is a pretty chain, adding detailing and interest to your design. It has flattened links and usually features 3 shorter links separated by a longer link. These alternating sizes of links catch the light and reveal a lovely sparkle. Figaro chain is available in sterling silver and 9ct gold at Kernowcraft.